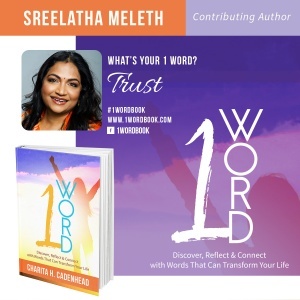 CLICK HERE TO ORDER YOUR AUTOGRAPHED COPY OF 1 Word: Discover, Reflect & Connect With Words That Will Transform Your Life featuring co-author Sreelatha Meleth. All orders from this page will be personally autographed by me, Sreelatha Meleth. ABOUT THE AUTHOR: Sree Meleth was raised in a Hindu Nair family by a devout father and an agnostic mother. She was working her way through the normal teenage angst of trying to decide whether she believed in God or not when she lost her mother in a plane crash at the age of 19. With her mother, Sree lost her sense of home, her single steadfast source of emotional support and her trust in life. 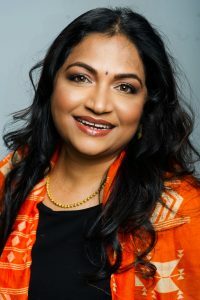 A few months later, still bruised, shocked and very tired of the back and forth in her mind about whether or not to believe in a God, Sree decided to try living as if she were a believer. Today, some 38 years later, that tentative step towards faith has blossomed into a steadfast knowing and unshakable connection. Sree now lives her spirituality. She has developed meditations and practices that have helped her to be fully accepting of her life in its entirety. The chapter in this book on Trust reflection of that unconditional acceptance she has learnt and is getting ready to  teach through her online courses on Radical Self-Acceptance.